In the end of the 12th century, the first groups of people from Upper Valais crossed the mountain passes to settle in the neighbouring mountain valleys. The emigration reached its peak in the 13th century and ended in the middle of the 14th. 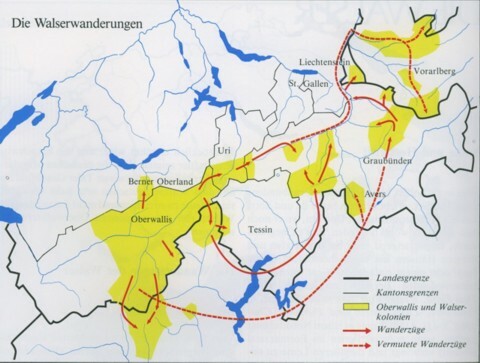 It can’t be said for sure why the farmers and herdsmen left the “Goms” (Upper Valais) particularly south- and eastwards and consequently turned from “Wallisern” to “Walsern”. Was it due to the great number of children that caused an overpopulation? Was it because of natural catastrophes, climatic changes or the plague? Did the drought which was caused by the dry climate 700 years ago force them? Or was it just their desire for adventure? Today, nobody can be questioned about this any more and documents are missing. Seigniors with their family and friendship relationships played a central role. They allowed the migrated Walser to settle in unsociable regions. The population as well as the acreages grew enabling the seigniors to secure their income and claim to power. In many places, the settlers were given the “Walserrecht” (right of the colonists), i.e. the personal freedom, the right to create their own juridical communities and the right to free long lease of property. The latter states that in case of a settler’s death, the property devolves on his heirs. The Walserrecht was granted in return for moderate interest and the commitment to military service. Some groups probably crossed the Simplon before 1200 and colonised the southern side of the pass. Later, they expelled the Roman population from the region of Zwischenbergen. In the 13th century several Italian high-laying valleys were populated. Settlers from the Saaser valley settled in Pomatt (Val di Formazza) and in Gessoney settlers from the Matter valley, for example. Walser from the Pomatt continued their migration in the middle of the 13th century and founded Boso-Gurin, the only German speaking community in the canton Tecino. Further Walser settlements can be found in Alagna, Macugnaga, Ornavasso, Rima and Rimella. In the 12th and 13th century, German speaking people from Valais settled in Savoy. They built three settlements there two of which are stilled calles Les Allamends today. The German dialect expired long ago there. People form the Lötschen valley built new homes in the Bernese Oberland in the 12th and 13th century. They settled in the Lauterbrunnen valley and in Planalp at the foot of the Brienz Rothorn. A further settlement was founded west of Thun. The so called Lötscher were remigrants into the Bernese Oberland. People from the Upper Valais crossed the Furka as early as the 12th century and settled in the middle of the Roman population of the Urserental. From here, single clans penetrated over the Oberalppass into the headwaters of the Rhine and downstream as far as Obersaxen. Other colonies of Graubünden owe their origin to immigrants from the southern colonies. The first Walser in Averstal and in Rheinwald descended in large part from the Pomatt (Val di Formazza). The Walser colony in Davos was probably founded by settlers from the lower part of the German Valais and the western parts of the southern colonies. From Rheinwald and Davos, the surrounding mountain valleys were seized. People from the western parts of Upper Valais or dependants of the Davos’ group reached as far as Liechtenstein and the Austrian federal state Vorarlberg. In Vorarlberg, the Große Walsertal (great Walser valley) and the Kleinwalsertal (small Walser valley) still bear the name of the immigrants.